Rev. 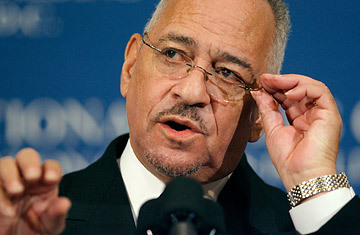 Jeremiah Wright, addresses the National Press Club April 28, 2008 in Washington, DC. Maybe Barack Obama skimped on his contribution when the offering plate came past at Trinity United Church of Christ. Or perhaps he nodded off during one of Rev. Jeremiah Wright's sermons. It's hard to think of another reason why the Illinois Senator's former pastor would put on the kind of performance yesterday at the National Press Club that can only be described as a political disaster. Until the question-and-answer portion of his appearance, Wright had been using the multi-city tour to redeem his reputation as a teachable moment. In an hour-long interview with Bill Moyers on PBS last week, Wright discussed in detail the history of the African-American religious tradition and presented a calm, erudite counterpoint to the outrageous caricature that most Americans have seen in the short clips of his sermons on YouTube. His speech to the Press Club continued in the same vein, providing context for what he sarcastically referred to as "the unknown phenomenon of the black church." But while Wright is a theologian, a teacher and a pastor, he is ultimately a performer. In front of a cheering crowd of supporters that included a whistling Cornel West, he gave into temptation and lustily went after his critics. As soon as the questions began, Wright transformed into a defiant, derisive figure, snapping one-liners at the unfortunate moderator tasked with reading the questions and stepping back with a grin on his face after each one, clearly enjoying himself. Could he explain the context behind the sermon he gave after September 11, 2001? "Have you heard the whole sermon? No? That nullifies that question." How does he respond to critics who charge that he is unpatriotic? "How many years did Cheney serve?" Does the fact that Obama says he never heard Wright's most controversial sermons mean he's not much of a churchgoer? "He goes to church as much as you do. What did your pastor preach on last week?" It continued through a defense of Louis Farrakhan and Wright's insistence that the U.S. government may have introduced AIDS into the black community. Not surprisingly, the Obama campaign has strenuously refused to comment on Wright's remarks. But top strategist David Axelrod reminded MSNBC viewers this morning that Wright was "out there doing his own thing." "It's a free country," he added. "But to the extent that people impute to Senator Obama words that are not his and sentiments that are not his, it's obviously not helpful." The combative pose that Wright chose to strike is perhaps most damaging not to Obama's candidacy  although the candidate will surely endure yet another round of scrutiny regarding his relationship to the minister and his positions on Wright's views  but to Wright's own message. Because he is right when he says that most Americans don't understand the black church and that their resulting confusion and fear contributes to a racial divide. Many Americans who were shocked by the clips of Wright's sermons have only known a Disney-fied version of the black church. We know about the good music, but don't listen to the lyrics of pain and suffering. We praise the rousing preaching without paying attention to the words. Civil rights leaders have become aging wise men revered for their inspirational sayings, not radical activists who preached truth to power. "There is so much more going on in black churches than gospel music," says Emilie Townes, professor of African American religion at Yale Divinity School. The poster boy of the reimagined black church is Martin Luther King, Jr. "King said America suffered from a 'congenital disease' and that disease is racism," notes Eddie Glaude, Princeton professor of religion. He says that King's speech against the Vietnam War, delivered at Riverside Church in April 1967, was not a feel-good speech. "It was a passionate cry to speak to these enormous problems that were linked to America's imperialism and militarism, and what he saw as the evils of capitalism." By that point int his career, King had been banned from Lyndon Johnson's White House. The New York Times condemned his speech, running an editorial calling it "Dr. King's Error." And Barry Goldwater said King "bordered a little bit on treason." But that King, the one who sounded a little bit like Jeremiah Wright, is not the one we remember every January. It's because the prophetic black church tradition has been filtered into an unthreatening form suitable for public consumption, so that it has been rendered, in Wright's word, "invisible." And it is because of that invisibility that Wright's sermons seemed so shocking and out of the mainstream. In reality, the two strands fit together  the unbearable optimism of "I Have a Dream" and the righteous anger of "I cannot be silent." Wright acknowledged that fact when he ended his remarks at the Press Club by talking about the need for reconciliation. It is "where the hardest work is found for those of us in the Christian community," he said. The way in which he responded to questioning shows just how hard that work will be, both for Wright and his most famous congregant.